Happy birthday Dear Anas Klari - birthdaywishes2- Birthday wishes sms,birthday wishes images,,special birthday. 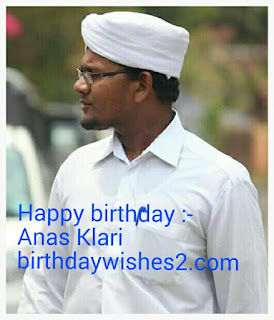 Anas Klari is celebrating his 29th birthday today. He work as a sub editor at Siraj Daily newspaper. His high school was at Markaz H.S.S karanthur. He completed his graduation at calicut University. 30th June 1988 is his birthday.